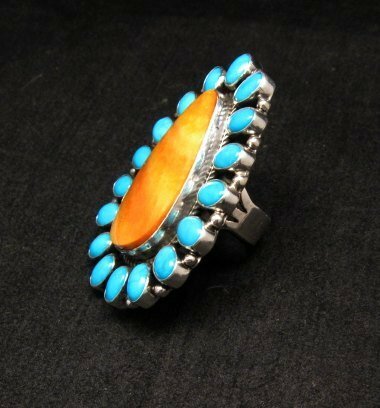 Up for your consideration is this fabulous Native American turquoise & spiny oyster sterling silver cluster ring was hand made by Navajo silversmith, Geneva Apachito. 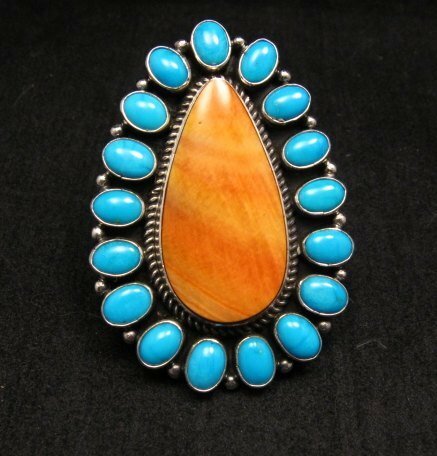 Features 17 genuine turquoise stones, surrounding a teapdrop shaped piece of orange Spiny Oyster shell. Wide 3-way split silver ring shank. The face of the ring measures 2-1/8 long by 1-1/2 wide at the widest point. Ring weighs about 26.5 grams. Size 8. Brand new in perfect condition. Stamped sterling and with Geneva Apachito's hallmark. Certificate of Authenticity included and gift box included. 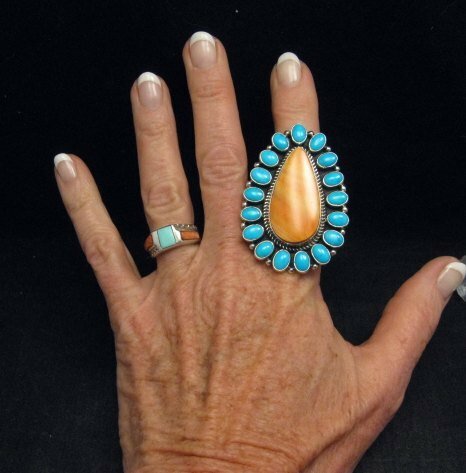 Geneva was born in 1969 in Socorro, New Mexico, She was taught silverwork by her mother, Genevieve Apachito.